This Office Yoga Virtual Teacher Training has been developed by San Francisco based yoga instructor and entrepreneur, Kim Sin. Kim's mission is to bring accessible, effective yoga and mindfulness programs to the workplace. 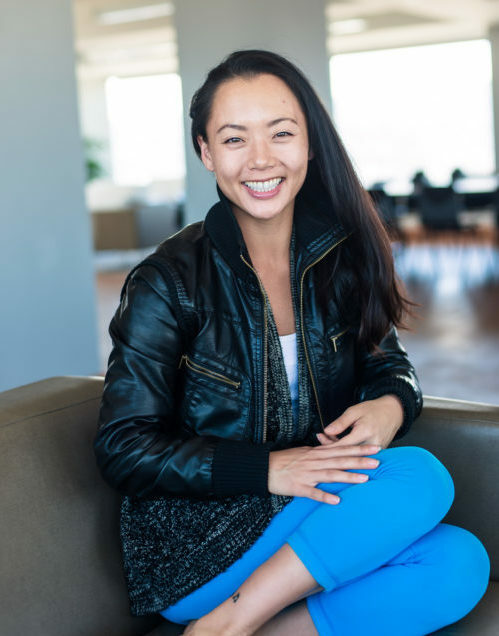 In 2011, she founded Kim Sin Yoga which partners with leading San Francisco Bay Area companies to design and implement office yoga and mindfulness programs to companies that are changing the world. Kim has spent eight years building a top, corporate yoga company while honing her teaching skills for the unique environment of the workplace. She is thrilled to share her expertise with teachers aspiring to teach office yoga/and or build thriving corporate yoga businesses of their own. Kim has trained under senior teachers including Jason Crandell and Alexandria Crow. She has over 1,000 hours of training and has worked with more than a 100 companies delivering mindfulness programs. Kim’s work has appeared on the cover of Yoga Journal Magazine, the SF Chronicle and MindBodyGreen. Outside of class, Kim loves exploring new restaurants, traveling to warm sunny beaches and finding new ways to incorporate the teachings of yoga into daily life.